Downers Grove Police Chief Robert A. Porter announced today that a suspect has been arrested in connection with recent burglaries in the Denburn Woods neighborhood. On July 28, 2011, officers responded to the 1300 block of Turvey Road for a report of burglary to a vehicle where the offender possibly possessed a firearm. The offender fled into a nearby wooded area and after an extensive search of the Maple Grove Forest Preserve, could not be located. Acting on investigative leads, police executed a search warrant on July 29, 2011 at 1443 Maple Avenue. Officers located a pellet rifle and proceeds from thefts and burglaries in the Denburn Woods area. 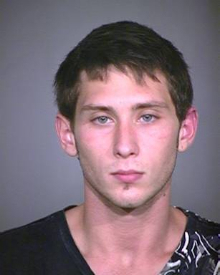 Police arrested 19 year-old Andrew Walczak at the house and subsequently charged him with one count of Burglary. Mr. Walczak is currently being held at the DuPage County Jail. Bond has been set at $75,000.00. Members of the public are reminded that these complaints contain only charges and are not proof of the defendant's guilt. A defendant is presumed innocent and is entitled to a fair trial in which it is the government's burden to prove his or her guilt beyond a reasonable doubt.